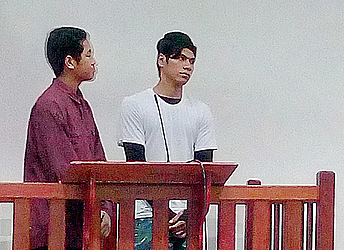 The two young men accused of robbing and setting Farmer’s store on fire last month have pleaded guilty to all the charges against them. Jack Michael Oge and Robert Kalati Smith have admitted to charges of theft, arson and burglary. The men are from the villages of Lalovaea, Palisi, Lauli’i and Salelesi. The Chief Justice, His Honour Patu Tiava’asue Falefatu Sapolu. is presiding. According to the Police Summary of Facts, the men stole 11 caps and four Bluetooth speakers. The goods were valued at $897.00. The store belongs to Tuituioaiga Teeking Weng of Vaiusu-uta and China. The matter has been adjourned until 17 May for written submissiosn from the prosecution and for a report from the Probation Office.